So am I all set on the PSK side of things? and just work on the FAK? Is there something that is missing that I am forgetting? The Lock n Lock boxes are nice for plastic. They seal well and come in several sizes. My pocket tin ran me about $50, maybe $60. Admitedly, I do carry more than the PSP, and the tin is a little bigger than an Altoids tin, but it is by no means hard to carry. Price would be lower now if I started with a PSP, but this is older than Doug's kit. And it isn't arbitrary. Have your priced the PSP and a good pocket knife? That is what most of us would consider the bare minimum, and if you are paying less than $50 bucks before tax and shipping for the two, someone got a deal. I agree with you Ironraven, the cost of a mini-kit can be quite high if you put quality items in it. The Altoid kits I gave my hunting partners last fall were similar to Doug Ritters home-made mini kit on ETS and they cost about 25.00 each. They did not have a knife (only utility/razor blades), sparklight (I epoxied welding flints into a groove cut in a Buffalo whistle) or a one-hand signal mirror (I included a very thin plastic mirror); so the cost was significantly reduced by substituting these items. I am now collecting the items to produce a quality small wilderness kit (actually a mini-kit within a larger belt pack) for myself. 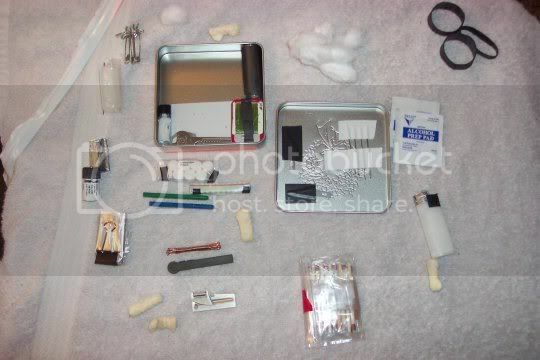 The complete kit will include sealed "survival items" (e.g. 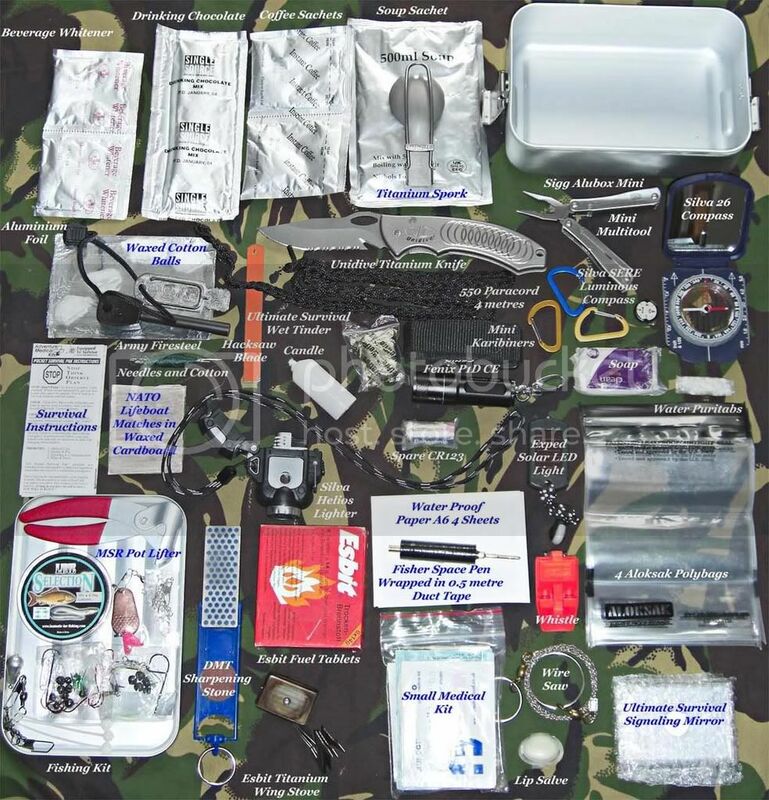 signal mirror, water purification tabs, fishing kit) plus everyday use tools (e.g, 550 cord, bandaids, whistle, knife sharpener). There will be duplication between the 2 sections so they can be seperated and you will still have the minimum equipment needed. In this kit I intend to use only quality tools so I anticipate the cost will be over $200.00. I hope it will actually lighten the load of "equipment in every pocket" that I have carried for years. I will post this new kit for review when it is assembled (I do not say "completed" because I am always making changes). Hey, I just found these and they look pretty cool. Has anyone seen them in person? They're made by Sigg, the same people who make the aluminum water bottles. They're anodized aluminum with a rubber seal, and come in large and small. Here's a link to the larger size. I use the small Sigg Box for an intermediate sized survival kit. The Sigg Box is a bit thin walled but does work at boiling water with the Esbit stove pefectly well without buckling despite Siggs warning that it should not be used in his way. I have recently spotted a cheaper hard anodised type copy, which looks a bit more durable and has a folding stainless steel handle similar to a British army mess tin, but has a waterproof sealed lid such as the Sigg. I use plastic Sucrets containers, plastic soap boxes, and appropriately-sized plastic kitchen containers. Bushcraft Science: It's not about surviving in the wilderness, it's about thriving in the wilderness. Can I ask where you got the Solar LED, and how well does it work? I've seen one at Tadgear but have been debating about buying. Generated in 0.046 seconds in which 0.013 seconds were spent on a total of 14 queries. Zlib compression enabled.